It's more than just avocados. When New York Magazine posed the terrifying question, "Have You Eaten Your Last Avocado?" in an article published Wednesday, avocado lovers everywhere panicked. Again. It's no secret that California's drought, the worst in 1,200 years, is a serious threat to certain foods. No one wants to acknowledge that this precious fruit -- yes, avocados are a fruit, because actually they're a berry -- might be a lot more expensive in the coming years. When Chipotle announced last March that its guacamole may be at stake due to climate change, people freaked. More than a year later, however, we're still enjoying guacamole at Chipotle and elsewhere. Still the threat looms, and a collective hysteria set in again Wednesday. That's because, yes, avocados are super trendy. Instagram is reaching peak avocado toast, and one too many Super Bowl fans really just show up at parties for the guacamole. But avocados aren't the only trendy food that may be affected by the drought. From kale to the almonds that go into everyone's precious almond milk lattes, other foods-of-the-moment may be more threatened than people realize. Though a number of factors put some California farm products at more risk than others, one major consideration is that some require more water to grow or produce. A single almond needs a staggering 1.1 gallons of water, while a single grape only uses 0.3 gallons. Beef, famously, requires a huge amount of water to produce, at 1,847 gallons per pound. While you're getting ready for grilling season or chasing after the cult favorite burger in your city, remember that beef requires more water than any other agricultural product. While everyone is freaking out about a possible guacamole shortage, they might want to start worrying about their hummus, too. 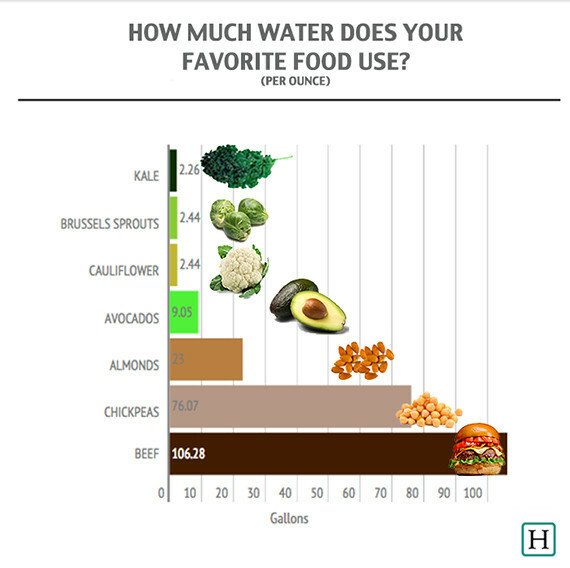 According to the data in these great water use graphics by the LA Times, California chickpeas require roughly eight times more water per ounce than avocados. With the demand for hummus in the U.S. only increasing, could the "drought + demand" equation that's worrying avocado fans translate to chickpeas, too? While California only produces about eight percent of all chickpeas produced in the U.S., worldwide chickpea production has gone down 40-50 percent because of droughts all over the world. Hang on to your hummus! All data from The LA Times and all photos from Getty. While California recently issued mandatory cutbacks on water for landscaping, it did not further restrict water use for agriculture. The farming industry, which uses four times as much water as urban consumers according to Newsweek, is under scrutiny for seemingly getting a free pass on restrictions, though the magazine also notes the industry suffered the loss of 400,00 acres of farmland last year due to the severe conditions. Will California agriculture see further water restrictions? For now, no, but the New York Times reported earlier this month that pressure to "move away from certain water-intensive crops -- like almonds" -- is likely. If water restrictions are eventually mandated for in-demand foods like almonds, avocados and chickpeas, in some cases, imports from other states and countries could help shore up supply. Food prices may fluctuate, but so far, they haven't increased significantly. We'll just be over here eating as much guacamole as possible in the meantime, just in case. And hummus too.